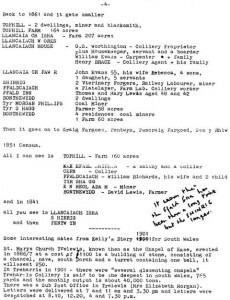 The Lewis family of Trelewis, Gelligaer, records 1601-1928“On the 1841 tithe map and apportionment for Gelligaer, Bontnewydd is recorded as a 60 acre farm in the possession of Daniel Lewis. 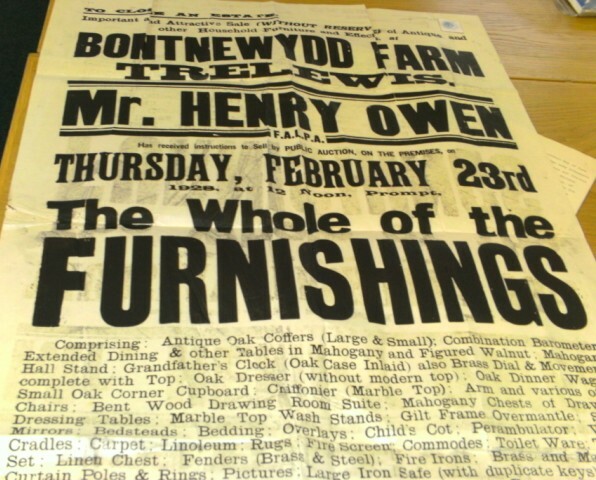 During the nineteenth century, this area became known as Trelewis, a small mining community’ In the 1891 Kelly’s Directory for Monmouthshire and South Wales, Bontnewydd House is the residence of William Lewis, farmer, landowner and colliery owner. 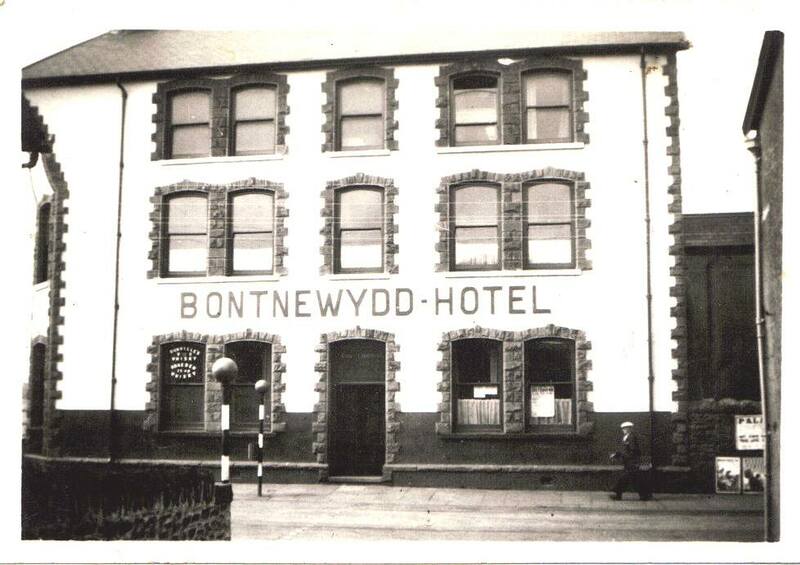 This is whom the village is named after- The original name of the district was Bontnewydd. 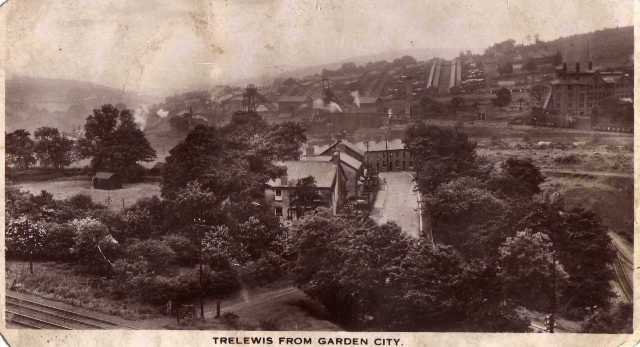 Trelewis grew as a community from a small farmland/wooded area in the Cwm Bargoed valley. In the latter years of the nineteenth century a coal mine was sunk in nearby Treharris and many houses were built in nearby Trelewis to house the workers. The Lewis family occupied Bontnewydd House and owned lots of land which was leased to tenants. Brynfynnon House was home to Captain Watkin Lewis who married the daughter of William Lewis of Bontnewydd,the house is now demolished but it is still called Captains Hill after Captain Lewis. 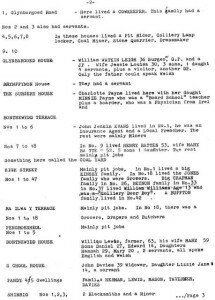 The Lewis family had influence over the village for many years in the 20 th century and Prunella Lewis JP was one of the last descendants of the Lewis family to reside in the village. 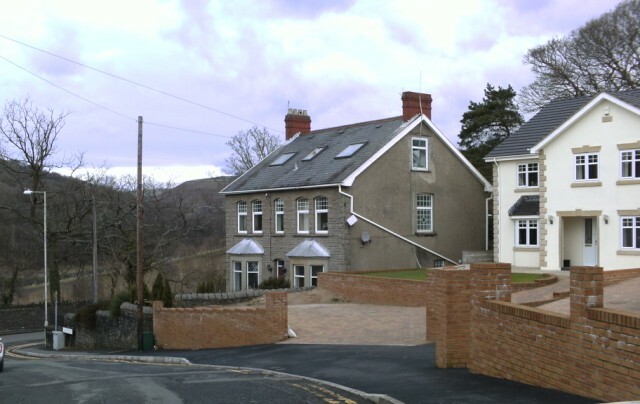 She moved out of the family farm (Bontnewydd House) into a large house on the entrance to Cherry Tree way, “Coed Ceirios” (Wild Cherry) pictured above on the left. . 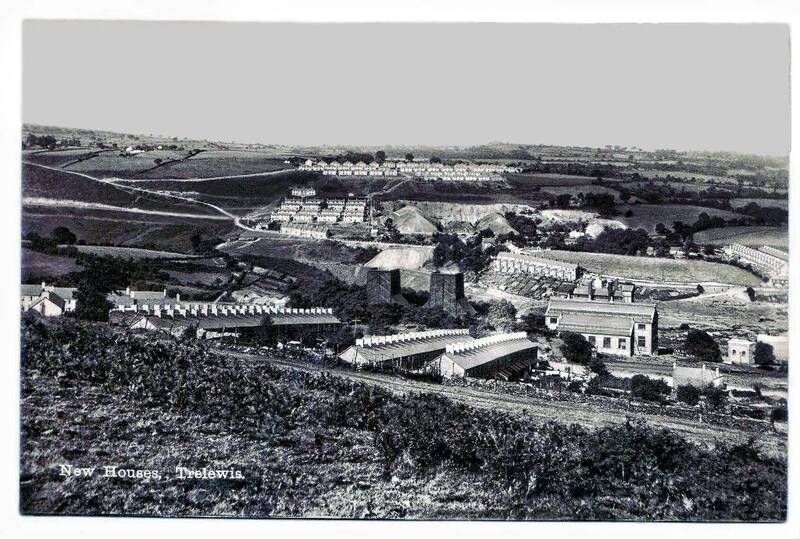 The Taff Merthyr garden village was partly built around 1927 to supply new houses for the workers of the new colliery (Taff Merthyr) to the north of the village, more houses were added after the second world war. One story that comes from rumours is that years later when gas was going to be supplied to the houses ,Pru Lewis refused access across her land and the residents of “Stormtown” as it was commonly called, have had to use solid fuel or oil to this date (2009). Talking to some of the older residents up in Stormtown and they seem to remember the reason there is no gas up there was due to the residents,who at the time, refused to contribute to the high costs of installation, that the gas board was demanding. 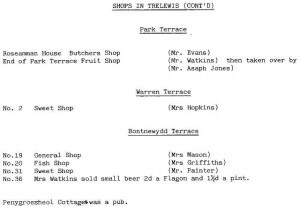 During the early seventies the Lewis estate decided to sell off some of the properties and at a discounted rate to the tenants. Bontnewydd House was sold to the Hotchkiss family for a remarkable price of £700. The Warren Family also purchased a large house next to Bontnewydd house. Other properties including a converted barn behind Cherry Tree way. There was a large field between Cherry tree lane and the railway line which were allotments worked by villagers for many years. Since Mrs Lewis sadly passed away new owners have moved into “Coed Ceirios” and have allowed two large homes to be built next door to the house, these were built for two local lads from the village and their families. Further up the hill another huge property occupies the large field that once housed allotments. Bontnewydd House was purchased by Phil and Sue Wood in 1988, they increased the size of the property and although it was modernised it retained many of its original features. Picture courtesy of Danny Melly showing a view from Stormtown of Treharris colliery…the old Power station can clearly be seen on the right of the picture. 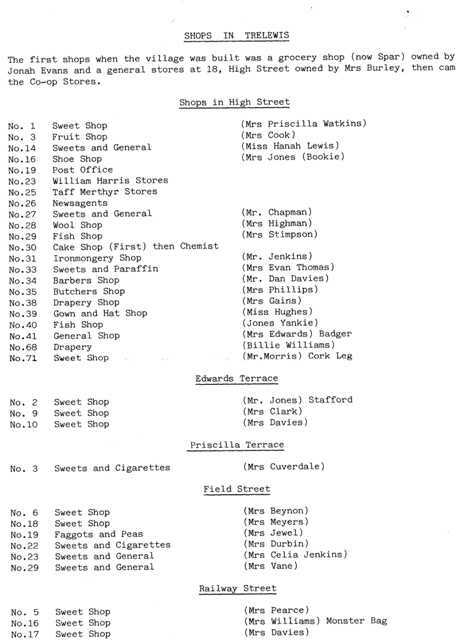 What Follows is a list of Businesses that used to flourish in the village, it covers many years and the exact dates are unknown to me. 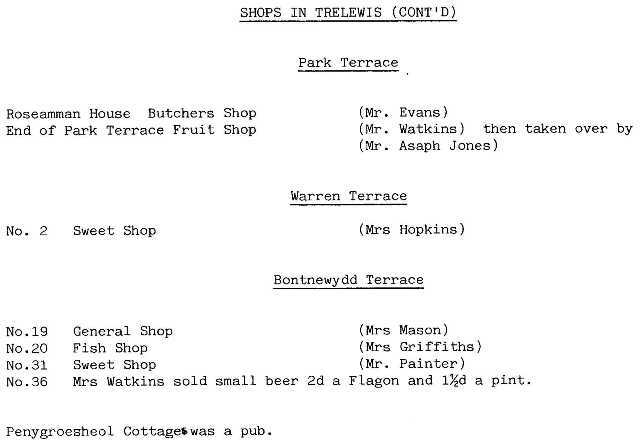 Thanks to Margaret Munkley of Pontygwaith we have been able to identify some of the families that lived in Trelewis in 1911. It is only a small sample and the 1911 census is now available on-line .This on line service will provide information on names and places from the 1911 census, there is a charge to use this service. 4 Ffladcaiach houses Mrs Davies plus three others. 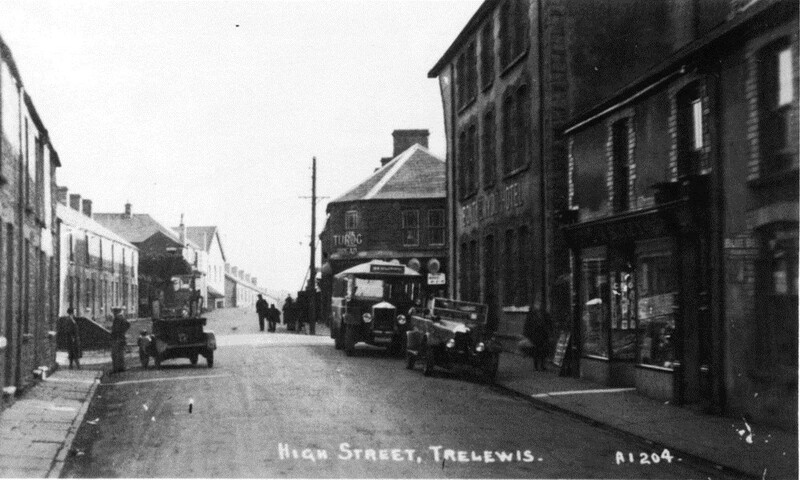 Above we see the Bontnewydd Hotel in 1940, to the right you will see advertising posters for the Palace cinema Treharris. There were troubled times for the mining families of the village in the 1930’s. Taff Merthyr Colliery was opened on the outskirts of the village in 1926 and there was work there for nearly 1,600 men, but from the outset, the colliery was a hot bed of militant action by the miners…The colliery owners insisted that only men who joined the Company union could work at the pit. The south Wales miners Federation (SWMF) urged men to join them instead of the Company union and there were scenes of violence in the village for many years between the followers of the rival unions. 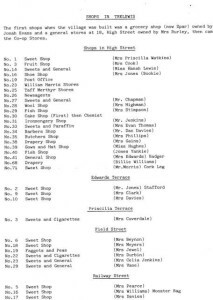 Torchlight processions, mass meetings and “stay down” strikes took place. The anger felt by the miners and their wives towards those that they felt were traitors to the SWMF, often spilt over to physical violence or other forms of intimidation. Hundreds of police officers were drafted into the Village from all over Wales many miners were arrested and some jailed. By the end of thirties the Federation was able to defeat the company union and peace came to the village. Trelewis drift mine was later sunk at the North side of Taff Merthyr colliery in 1954.Both pits went on to break Welsh mining records. This is the area at the bottom of the village that meets Nelson. The word Shingrug refers to early milling activity in the village, the word is a corruption of “Eisingrug “ eisen meaning husks and crug meaning a mound or a heap. Thus mounds of oats near the local oat mill would have been a feature of this district in by gone days. There used to be a Mill on the Mill Road at the bottom of Glyn Bargoed road in Trelewis. Shingrig is shown on the 1841 census of the area and is one of the oldest in the village. 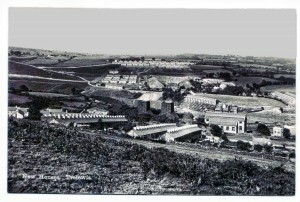 A large Housing estate was built here behind Macintosh and Caiach Terraces in 1960. These were Wimpey council houses and provided much needed houses. Many local families moved into these new houses but there were also a large influx of Scottish and Staffordshire families. 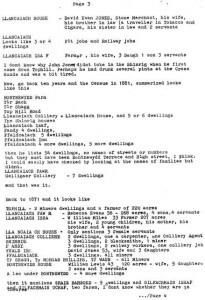 These new families moved here for the work but many left after a short time, however some families still live in the Treharris areas including the Richardson and Jeremiahs (originally from the Stoke areas) and the Toners and the Campbell’s from Scotland. St Mary’s church in the centre of the village was built in 1886-87- the church in Wales. The Church is no longer in use (2009) and as been converted into a residential home. Ebenezer (1889) demolished and now the site of four homes in a street called Tai Ebenezer. Trinity Baptist have just celebrated their centenary, they currently have a student pastor who is in her second year of Baptist college. The first entry in the Trelewis school log book reads “The Pontnewydd Board School was opened in the afternoon of the first day of January 1878 on which day 50 children were admitted”. The name Trelewis was not adopted until later. The number of pupils quickly rose to around 75 although the dimensions of the school are given as 35ft by 20ft. A new school was opened on 1st November 1881 Some of the buildings are still in place today and the school house is still in use 2009. The school celebrated its centenary in 1978 and It was replaced in 1984 with a modern new school in the fields behind the original buildings over a railway track. An impressive new footbridge was constructed to take the children from the original school yard across into the railway into the new school. Mr John Davies was headmaster of the school from 1883 until his retirement in 1913. Mr Thomas was the headmaster in 1970 and two of the teachers that taught 10-11 year olds were Mr Mitchell and Mr Huws. Mrs Hocking and Miss Owen were two long serving teachers during that period. The current head teacher in 2009 is Mrs Pamela Eyles B.A., Cert.Ed. On the site of the former infants school now stands a Jehovah Witness Kingdom hall and on the site of the junior school stands a new row of Terraced houses. Trelewis Welfare AFC was formed in 1966 but there was a history of village teams dating back to 1890. Bontnewydd House The oldest house in the village itself and home to the Lewis family for centuries after whom the village was named. It is situated on Cheery tree lane. Number 2 and 3 Bontnewydd are built in its former grounds. Two large houses in the middle of Stormtown used to be homes of the Taff Merthyr pit under managers. First street in Stormtown, the lowest street. This home is near to Storm town bridge, a lot of work has been done on it and it is looking very good. This large farmhouse is situated on the southern outskirts of Trelewis. It is possibly the best example of an Elizabethan mansion in the south Wales valleys. King Charles the 1st is believed to have stayed overnight(4-5 April 1645) as the guest of the owner Colonel Pritchard, during the civil war against Oliver Cromwell and the roundheads. It is now a museum and open to the public. The area is commonly known as Stormtown owing to its location on an exposed hillside. Ty Draw (Yonder house) Converted barn on Cherry tree lane, once part of the Bontnewydd farm. Two areas of Trelewis that were once old quarry workings. They were left abandoned and filled with water to form ponds. In the sixties and seventies the local children used to swim here, but it was extremely dangerous and alot of accidents happened there. At least one young lad lost his life in Trelewis quarry and parents feared for their children playing near these unguarded sites. Eventually both ponds were filled in with waste from the local collieries. Remember these are just a summary of the census. We will start in April 1891,108 years ago. The man charged with writing down the names of each dwelling plus the name, age, occupation and relationship to the head of the household was a Mr John Jones. He had to collate whether a person living at a dwelling was the head of household, or son or daughter etc, also where they were born. He had to note if they were blind, deaf, dumb or a lunatic. 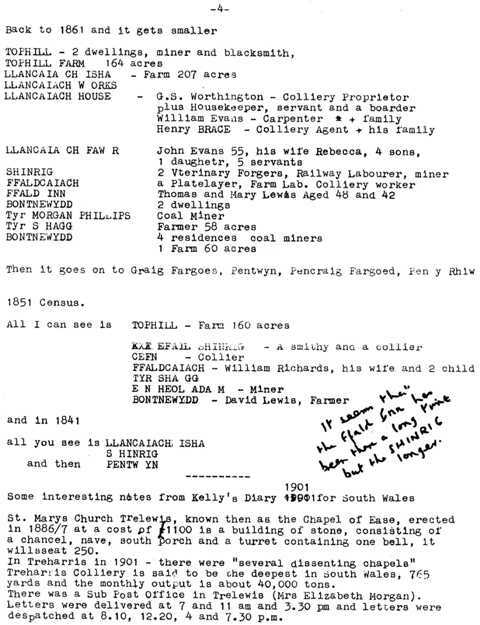 Interestingly for this census only he also had to enquire whether they spoke English, Welsh or both Languages. It appears there were no deaf, dumb or blind in the area and certainly no one admitted to being a lunatic, from the list of dwellings given it appears Mr Jones started his census at the top of Gelligaer, probably after a pint in the Cross…there is a full list of dwellings and also some of the people who lived in the dwellings at this time (not every person is listed). Top Hill 3 dwellings…one farm and two miners’ cottages. 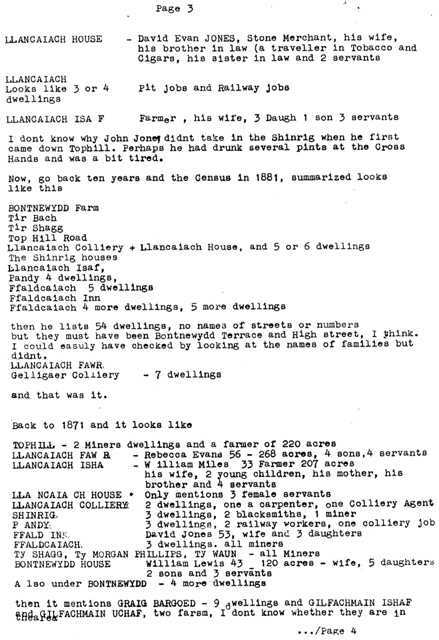 Llancaiach Fawr (Uchaf) Rebecca Evans age 79, William Evans Framer 43 son, plus 8 others including 3 servants. Adjoining building…2 colliers and a Tea dealer lived. Ffaldcaiach Inn, Edward Evans 53, Catherine Evans 46, wife, Janet Rowlands 21 servant. 3 dwellings close by lived a mason, sculptor, printer, coal miner and the dress maker Ellen Bray. Caiach Villas Numbers 1 and 2, both houses had a domestic servant. Bontnewydd House is also missing from the 1841 census but it was very much there, having been built in 16th century. 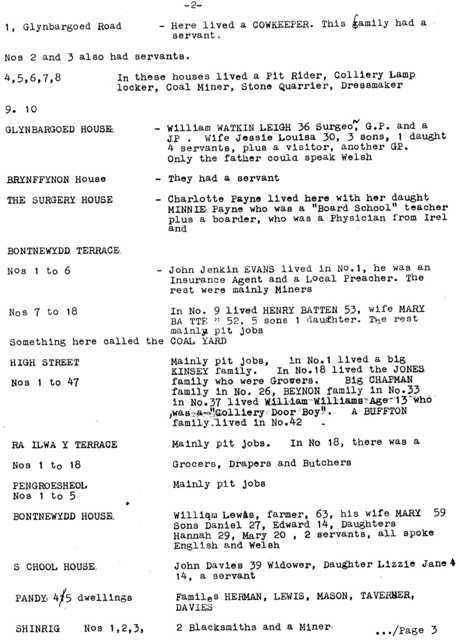 The 1891 Census revealed that there was a lot of Welsh spoken in the village, the same could be said of Bedlinog..an example can be shown by looking at Commercial street Bedlinog in 1891 the Census said that 38 people only spoke English, 65 people only spoke Welsh and 57 could speak both languages, that average applied to most streets in the area at this time. Massive thanks to Des Chapman of 6 High street, Trelewis for all the above Census information. He had it sent to him by a relative back in 1992.